I recently took some time to ponder my favorite airplanes and why they are what they are to me. When pressed on the subject I often say, “My favorite is one that’s full of gas and closest to the hangar door.” Or, “I like them all.” Although both are true statements, there are particular airplanes that really make me feel good when I fly them. Perhaps there are fond memories of past flights attached to these particular models? Upon further reflection, it’s not those memories I am reminiscing about on flights that inspire me to be a happy pilot in that given moment. The pleasure comes from a well-balanced aircraft that allows me to do nothing but look outside and revel in the joy of flight…an aircraft that has no quirks and is balanced enough to feel good all the time. Yes, there are numerous aircraft that possess this magic recipe and likely, one or another for each different individual. Probably the greatest accomplishment I could have in this life is to find every aircraft that fits me in this way. Best compared to golf. I’ll never finish this perfect airplane quest or achieve mastery of the act of flight but, I will enjoy every step of the way. The first WACO that I soloed was an 110hp RNF. I didn’t think much of it at the time beyond that it was nothing more than a stepping-stone. The value of this experience did not come to fruition until I later flew an RNF with 165hp. Although the Warner 110, in my opinion, was an unreliable little boat anchor of an engine, it provided a wonderful balance to the aircraft that made it an absolute pleasure to fly. It was like a butterfly. Power off and lightly trimmed it floated to earth so very gently. Slow flight and power off approaches just made you smile. Takeoffs were short and the aircraft levitated. Albeit there was no surplus of power it did just fine. There was a very nice balance. The 165hp RNF was great as well. It flew quite nice and did a much better job when power was needed. Indeed a well-balanced aircraft. However, I would be remiss if I ignored that the 165 powered craft did not quite have the balance and feather light touch the 110 powered aircraft did, particularly in power off flight. That experience really stuck with me and often crosses my mind when I’m parroting the “less is more” lecture to someone who wants to start installing kitchen sinks in his or her airplane. I particularly think this is also applicable when wanting to tinker with a design that really doesn’t have any issues or to force the particular design to try and do things it was never intended to do. Simply put, when you try to make an airplane be multiple airplanes in one the purity of its flight characteristics are compromised. It is fully understood there is no winning the horsepower and gadget argument. That is what people want! No matter how articulate the argument. The intent here is to help garner your appreciation for how much better a well designed aircraft feels and flies when it is closest to its type design and kept light. Considering the design is sound of which WACO’s definitely are. As a testament just try to find ADs and failures associated with them. Now, take the entire WACO “F” series. WACO had a pretty sharp stick by the time they got to the UPF-7. Numerous models of alphabet soup were under their belt in both the “F” and cabin series. Distilled down to the basics WACO pretty much built the same F model from the F-2 through the F-5 making superficial changes throughout the years. In short, a F-5 wasn’t much more than a gussied up F-2. Essentially the 1935 YMF-5 was the same as a 1932 F-2. Both good flying airplanes however, as I’ve flown a few examples of both. Take a second and apply the less is more equation and now add that the modern YMF-5 has been also changed over its original (1935) type design by: Lengthening the fuselage 6 inches hence moving CG aft, shortening the main gear, raising the tail and making the tail wheel fully steerable, adding full interiors with carpet and IFR panels with 24 volt systems. Furthermore, there are almost infinitely added optional items per the type design such as; two more fuel tanks (automatically adds larger oil tank) and whatever other bells and whistles you want to add. The slight trade off I described between a 110 & 165 RNF in the prior paragraph becomes magnified to the point the aircraft has vastly departed from its original feel and best shows its handling characteristics only in cruise! The other phases of flight become mechanical wonder bread experiences that lack the joys of flight and are just a numbers game. Proof in the pudding? Fly a light F-2 WACO and you will smile for a week. Anything over 60 mph and you glide past the airport. Takeoff roll and climb that make you feel like a rocket man. Fly a heavy F-2 WACO with steerable tail wheel, gadgets and lack of observation to weight consciousness and, drumroll; you could easily mistake it for a much heavier YMF in a taste test. Things get generic feeling pretty darn quick when you add weight in addition to tinkering with design basics. 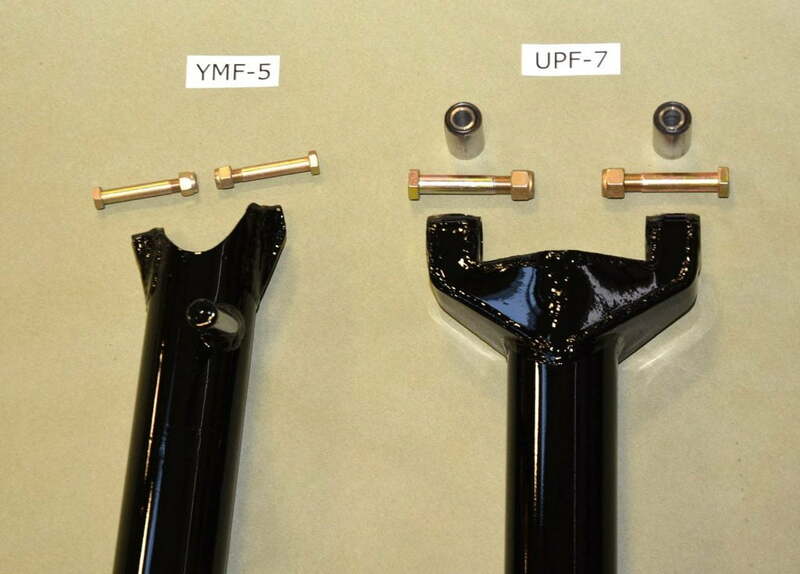 The UPF-7’s landing gear is two feet wider than any of the other “F” series. Furthermore the attach points and geometry are stronger. See the photos. Not only is there greater width and strength, there are cushioned inserts to help protect the airframe. This makes for an exquisitely simple handling aircraft on the runway that didn’t need to be altered to try and make it palatable to a modern user. I have seen in print the calling out of the UPF-7 undercarriage as “not updated and adopted from the cabin WACO”. Not true. 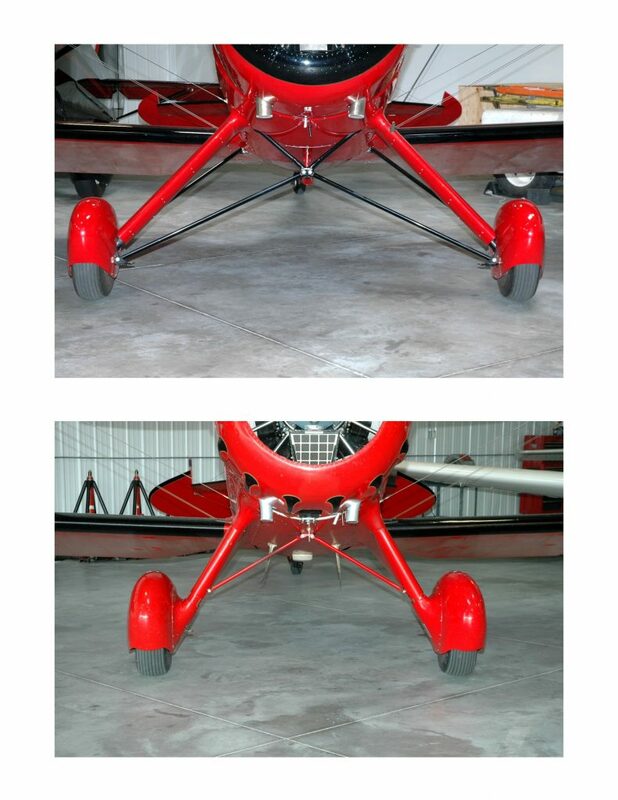 As a matter of fact, the UPF-7 landing gear was the last design by WACO and was subsequently used on the heavier, faster 1937 and on Custom Cabin series due to its strength, width and handling characteristics. Also, “only being slightly wider” as its only merit. If you call two feet “slight” then you haven’t analyzed aircraft very much. Two feet is a football field of width when you are talking the same series of an aircraft. As a matter of fact, the UPF-7 gear was the most advanced and last gear design WACO produced until their demise. Main landing gear attachment points. Control apparatus and mechanisms are added. Hence adding weight. Steerable tail wheel is coupled to the rudder. When adding this on an aircraft that wasn’t designed for this set up you are directly affecting the feel of the rudder hence adversely affecting flight control harmony. Steerable tail wheels are for taxing. On the runway they augment the oscillations from centerline. WACO built a great aircraft that has a very effective rudder which works great at all speeds. Regardless of model. Just because the tail dragger you learned in has a steerable tail wheel doesn’t mean every aircraft after has to be set up the same. Let experience evolve your desire in an aircraft. Not an idea someone else sold you on that seems like a good idea. The center locking tail wheel dampens the oscillations or centerline deviations while providing a more controlled and solid feel in regards to directional control. Furthermore, the UPF-7 was the only F designed with toe brakes and articulating rudder pedals. All other F models had hand brakes originally so the ensuing outcome to adding modern brake arrangements are a half-baked set up that has to be fit into a cockpit that was never designed to permit such. The UPF’s toe brake & rudder arrangement is really an awesome design. As you apply full rudder the articulating brake pedal comes up to meet the upper portion of your foot automatically providing gentle, progressive application of brake. If you just taxi the aircraft using the rudder pedals and let the brake pedals come into play you would swear there is a steerable tail wheel back there. Cockpits are roomy as originally designed. No lengthening of the fuselage required. The CG and stations are all as originally intended. Balance is evident. The UPF is the only F that doesn’t have dihedral in all four wings, just the lowers. I am no aerodynamicist or engineer, just a kid that has been lucky enough to get his hands on a few airplanes. To my touch, having the flat rigged upper wing gives you the best of both worlds; uppers help provide a crisper roll rate providing nice aerobatic feel while the lowers help provide the hallmark WACO stability return to center feel on a bumpy day. The upper wing is also higher from the fuselage than the other F models making front cockpit access and view much better for passengers. Also of note the UPF-7 has an airfoil shaped empennage. While still counter balanced like all the other models, the UPF-7’s tail surfaces have ribs providing substantially more chord due to its airfoil shape. If flat control surfaces were so great we would all be still safely enjoying designs of the 1920’s! Which WACO continued to force into production until the mid 30’s. The UPF-7 is a stout airplane compared to the other F models. Wings, fuselage and undercarriage are all executed with more modern engineering for the rigors of daily use and aerobatics. When the opportunity was presented to supply an aircraft for the specific use of training cadets WACO didn’t go back in time, dredge up and utilize an old design for a multitude of likely reasons. For example, the original WACO factory only built and sold 20 YMF-5s. One could cite the economic climate of the period as a factor for only 20 but keep in mind several other manufactures were building and selling aircraft in greater numbers, which cost equal to or more. In reality WACO likely knew that utilizing a design that they milked from 1930 to 1935 wasn’t going to cut it in either performance or consumer perception. Subsequently only 20 were built. Two years later, in 1937 WACO began with the UPF-7 and had tooled up to produce over 500 units with heavy production starting in 1940. Despite what detractors may say, the UPF-7 was made out of 4130 tubing per the material lists on the original drawings. The rest of the age discussion pertinent to safety and what we build doesn’t matter. Why? Because the UPF our team offers is new. Some may say we can’t really offer that but I invite you to come visit us and apply your own definition to our process. Marry this great design with a limited supply that has history while applying our new build standards and you have an investment grade aircraft that handles like a million dollars. After all, if you want a pallet for a modern swoosh paint job, avionics and ornaments, why not just save yourself the cash and buy a 182 Cessna. They fly pretty much the same empty or at gross weight too. I can’t praise the merits of the UPF-7 based on comparisons to a Porsche or some other abstract ideas. For forty years I have been immersed in only one language, airplanes. Which did my father and those in the realm of vintage aircraft for long before I, whom I’ve had the privilege to be around. In short, we share with you the merits of the UPF-7 by having arrived at our conclusions by evolving into them with experience. We didn’t buy into a production line, dealership or idea based on a need to feed a hobby or make a living. I am really passionate about this because the UPF-7 has been one of the few to deliver the joy I spoke of earlier. It is a rugged and comfortable aircraft I can confidently take anywhere. Come visit us, we would be happy to take you flying and show you first hand. I am lucky enough to have grown up doing this. Personal experiences, the elder generation and lifelong peers in aviation have shaped my ideas. This isn’t what I need to do or have chosen to just try, this is what I love to do, believe in and really enjoy sharing with people. I am competitive based on my experiences as a pilot, IA, airplane geek and the passion I have for this life in aviation. If there is one thing I seek the most joy in is imparting the understanding of how good it can really be. Not just seeing someone roam around in something that they were led to think is good based on a personal agenda rather than experience. As a basis of comparison for this post, I have flown these WACO models in the past and in some cases several examples of each model. For example, I have flown 20 plus UPF-7’s and nine YMF-5’s. Model list to date: RNF, UBF, QCF, YPF, YMF-5, UPF-7, CUC-2, ZQC-6, AGC-8, EGC-8, UEC, UIC, YKC-S, YKS-6, ATO, ASO.